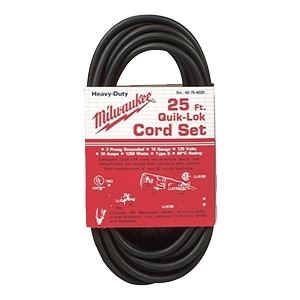 PRODUCT: Milwaukee 25 foot Quik Lok Power Cord. Price/Each.. DESCRIPTION: This Milwaukee quik-lok cord is a three wire grounded 25 foot cord for fast field replacement of a damaged cord. Made of premium grade hi-flex wire the cord is quickly removed and attached to Milwaukee tools with the quik-lok cord feature.